Perfektes Sommer-Familienferien-Häuschen auf langem See nahe Traverse City! Der wunderschöne Long Lake ist einer der besten Angel- und Sportseen im Nordwesten von Michigan. Es ist fünf Meilen lang mit sandigen Küsten und fünf Inseln. Cottage mit 2 Schlafzimmern, nur 10 Meilen entfernt. von der Innenstadt Traverse City zwischen TC und Interlochen. Dies ist eine wöchentliche Miete * NUR * Vermietung ist von Samstag bis Samstag. Birchwood Cove, bietet einen perfekten Ort für einen Familienurlaub in einer parkähnlichen Umgebung mit reifen Eichen, Buchen und Pinien, eine gepflegte Rasenfläche, die den ganzen Weg hinunter zum Strand und eine ruhige, private Umgebung geht. Die Bucht ist ein schöner Ort zum Entspannen und Genießen der Sehenswürdigkeiten und Geräusche des Sees und der Tierwelt. Jedes Jahr genießen wir ein Paar Nistdörfer, Frösche, Fische und Schildkröten, Kraniche / Reiher fliegen über den See und silhouetted in der Sonne, Adler, Falken und Hirsche. Es gibt zahlreiche Restaurants in der Region, viele davon in wenigen Kilometern Entfernung. Die Interlochen Arts Academy liegt 5 Meilen südlich des Resorts. Viele neue Updates für 2017 enthalten ein neues Dock, neue Fliesenböden im Esszimmer und Küche, neue Arbeitsplatte, neue Spüle und Wasserhahn, neue Klimaanlage, neue Fenster, neue Fliesen und Holzböden! Das Ferienhaus bietet Platz für 4 Personen mit zwei Schlafzimmern. Strand Annehmlichkeiten gehören Feuerstelle, Dock, Schwimmfloß, Ruderboot, flachen Sandstrand in einer ruhigen Bucht. Sie können 1 Boot mitbringen und es an das Dock binden. Die Strandfront wird zwischen allen Vermietungen geteilt. Die Hütte hat einen Gasgrill und einen Picknicktisch. Die Küche ist komplett ausgestattet mit Mikrowelle und Kaffeekanne. Bettwäsche und Handtücher nicht inbegriffen. Ruderboot, Kanu, Schwimmwesten, Ruder, Anker, Insel, Feuerstelle, Picknick-Tisch, Kreis fahren, parkähnlichen Umgebung, 700 'Einfahrt von der Straße. This was our first visit to this area and we loved it! Convenient to Traverse City, Sleeping Bear Dunes, Mission Point (wineries, cherry farms, lighthouse) and other local favorites (national award-winning Moomers Ice Cream, Lake Ann Brewery, Natural Education Reserve trails). With this rental we were able to utilize a sand beach and shed full of beach toys and rafts, kayaks, metal boat, and paddle boards -- which was a definite plus for us and our 8-yr old son. The house is small and has a simple, workable layout. It had been recently updated and worked well for the three of us, but we're not ones to spend a lot of time inside. The house doesn't have a very good view of Lake Long, but the lake is very close and walkable across a yard. We enjoyed coffee on the boat dock that went with the house, and fires on the lakeside beach at night. The cottage was very clean nicely updated. We had a wonderful time. Perfect for a small family. Fishing was good. Neighbors were also very friendly and helpful..
Great location! Just a short drive to Traverse City or Interlochen. Nice sandy beach and water is perfect for small children since it doesn't drop off fast. Owners provide row boat, canoe, life vests and even rafts for added fun. Rental home has its own picnic table, lawn chairs and a charcoal grill for outdoor dining. The interior of the home is a little outdated, but was clean upon arrival and had all the amenities of home such as a full size refrigerator, stove, microwave, coffee pot and plenty of dishes and glasses. The reason I gave it 4 stars was for two reasons. The first being there was no central air conditioning or ceiling fans, but the owner did provide 2 floor fans which helped. The second being the size of the recently updated bathroom. The vanity is too big (should have put in a pedestal sink) therefore when sitting on the commode your knees hit the vanity and I'm only 5'5. This could be a problem for someone who is tall, overweight or has balance issues because it was difficult sitting on the commode or having to step over the commode to get into the shower. Owners were great to work with and even permitted us to bring our little dog. Home was the perfect size for my husband and I, but might be cramped for more than 4 people. Overall we had a lovely stay and would recommend this home to others. When arriving to the property we though it was a nice place. A little outdated and far from the lake but nice. 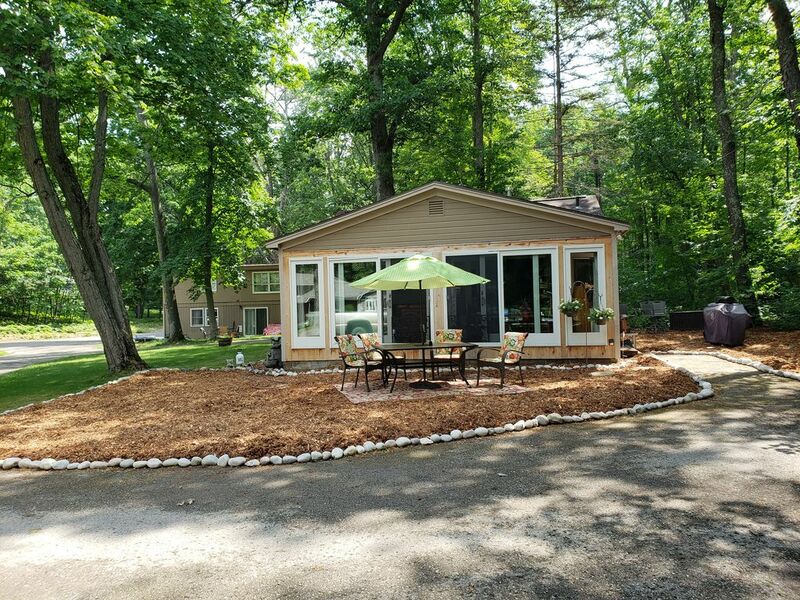 When booking this place we informed the owner that there will only be 6 people staying at the cottage but we have a large family that likes to come visit and spend the day at the lake. The owner informed me this would be fine. On our 3rd day we were having family come to spend the day at the lake about 16 of us total. We were at the lake playing when the owner arrived at the cottage and rudely informed us that we are being too loud, at 2pm, and everyone had to leave. She stated we were only allowed to have 2 visitors at a time. This was never stated in the contract or anywhere on the website. The other tenant had a dog that pooped everywhere and it was never cleaned up. One of the other cottages had about ten cars parked outside. We also ended up having two people walk by our cottage and peek in our windows and doors. Mind you my son was getting changed in one of the bedrooms. I do not recommend anyone to rent this place unless you want to deal with rude and inconsiderate people!!!! In response to your review of your stay at Birchwood Cove I'd like to point out that while you were visiting we received complaints from all our other guests about the great disturbance your group was creating. As property owners and resort operators we take complaints and conflicts seriously and will take steps to ensure guest privledges are not abused. We offer a quiet, safe and fun environment for families to enjoy our very large and maintained yard and beach frontage. When reserving our cottages/house we inquire on how many people will be present. Telling property owners you have a lot of family and friends in the area and assuming it is OK to invite them all (an additional 20-30 people at times) to the resort everyday is unacceptable. Had you asked if this was allowed, you would have been informed that we allow an additional 2 day-use guests in addition to the maximum number of people allowed in each unit. Exceptions to this guideline are made an an individual basis, as determined by the managers of the property. Our resort is a private homestead, not a public park. For over 25 years, our family has shared our beautiful and unique property on Long Lake with others. We are successful because we offer a peaceful and quiet environment, clean and affordable cottages, a clean and sandy swimming area, a large beautiful grassy area extending to the lake and we limit numbers to ensure everyone has enough room to enjoy themselves. This is why our properties are in high demand and the majority of our guests are families that come back year-after-year. Our guests are those who respectfully enjoy the beauty of our property while making wonderful memories and creating family traditions at Birchwood Cove. We rented two cottages. We had a great time. The lake area was so nice since in a cove and even though the weather wasn't the warmest our grand kids loved it. The canoe and rowboats were added fun. We were able to moor our boat very near the dock which was handy. The beds were fine but the pull out sofas are just that and of course not the best beds for adults. The cottages were clean and that is a plus for sure. Was relieved we were able to take our dog. We enjoyed our stay very much. We stayed the week of July 16th. It was very hot this summer. The lake was great as usual and the fishing was not bad. The kids had a great time swimming. My daughter and son-in-law were so happy to be there. A good family place for a vacation. Thank You, Narda. We are pleased that your families enjoy your stay with us. I hope your stay this summer was as good!